Danny Solis claims he wasn't invited to Friday's debate. 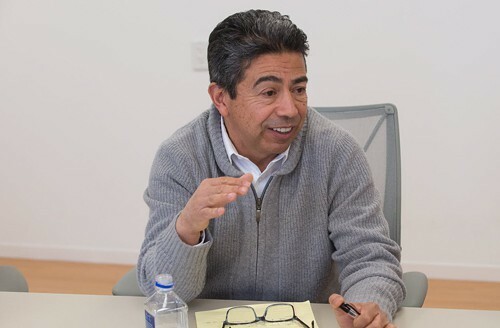 Incumbent alderman Danny Solis will not participate in Friday's UIC-sponsored 25th Ward aldermanic forum, an event that would have marked the first opportunity for voters to see all five candidates from that race in one room. Solis spokesman Tom Bowen said the office never received an invitation to the event and now will not be attending due to a scheduling conflict. The forum is being hosted by UIC student organization United Students Against Sweatshops. The group's president, Jeff Uehlinger, says they e-mailed Solis's office on January 30 and followed up with a string of unreturned phone calls to the ward this past week. Byron Sigcho, 25th Ward candidate and UIC instructor, said he saw the alderman Wednesday afternoon at a private meeting held at Smyth Elementary with residents of the Near West Side's ABLA Homes. At the meeting Sigcho made an announcement about Friday's forum, which Solis claimed to know nothing about. Sigcho said it's just another example of Solis evading constituents. "I think he owes the community some answers. There are definitely a lot of things he needs to clarify," Sigcho said. "It seems to me he's very comfortable in thinking, if he keeps a low profile, he can avoid these questions and deal with it after the election. It’s critical that we hear from him now." In addition to Sigcho, the three other 25th Ward candidates will attend Friday’s forum, including Chicago Public Schools teacher Ed Hershey, immigration activist Jorge Mujica, and former Solis chief of staff Roberto "Beto" Montano. Questions will revolve around issues affecting the UIC community, including questions around undocumented students, commuters and minimum wage, according to Uehlinger. The 25th Ward forum begins at 6 PM on Friday at the UIC Latino Cultural Center of Chicago, 803 S. Morgan. Because serving up free breakfast is a good socialist thing to do.